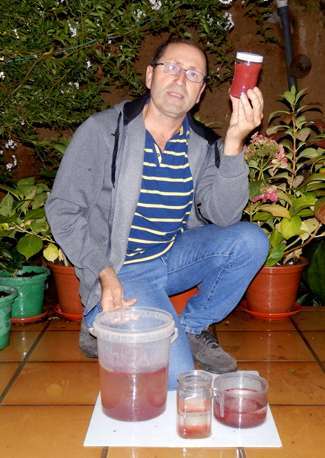 The rainwater that fell in some of the villages of Zamora (Spain) last autumn brought along a strange traveller: a green microalgae that turns a reddish colour when in a state of stress. Once this microalgae was deposited into fountains and tanks it wasn't long before the water turned red. Researchers from the University of Salamanca have shone light on this 'blood rain' phenomenon, yet they have not yet been able to identify the mysterious origin of these little algae which are also present in the pharmaceutical, food and even automotive industries. 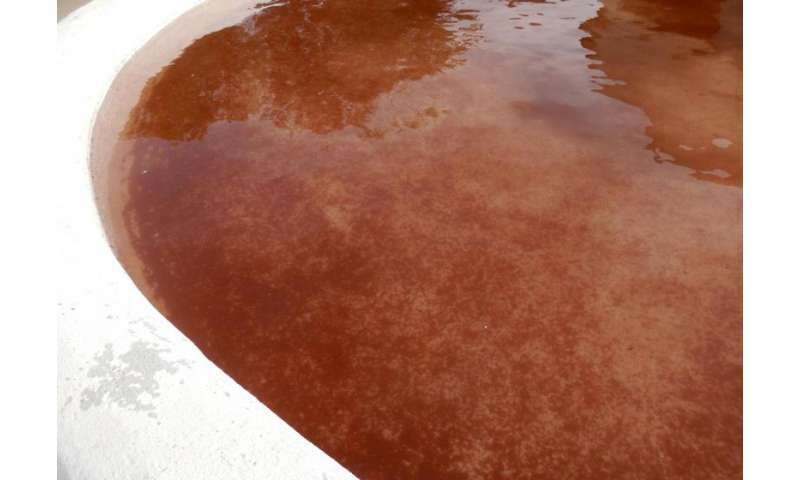 In 2014, neighbours of Fuente Encalada in Zamora were astonished to see how the water in the white basins had turned red. Some immediately thought that someone had spilled something into the basin, or even that contaminants had been dumped from airplanes. And of course there were some individuals who did not fail to remember the Biblical plagues. News travelled to the neighbouring village, Ayoó de Vidriales, where one resident, Joaquín Pérez, decided to collect some rainwater in order to monitor this phenomenon over the course of both last autumn and last winter. There was no doubt about it: there were some small particles appearing both along the edges and at the bottom of the containers that were staining the water red. In order to solve this mystery, the intrigued neighbour decided to send some samples to scientists at the University of Salamanca. The results have just been published in the 'Spanish Royal Society of Natural History Journal'. "The reddish staining is caused by Haematococcus pluvialis, a freshwater green microalgae that is capable of synthesising a red carotene pigment called astaxanthin when in a state of stress," explains the geologist Javier Fernández-Lozano, co-author of the study, to SINC. Light microscopy allows us to observe the complex life cycle of these unicellular algae. During some stages they can move using flagella, while during others they can form cysts if conditions are unfavourable, thus turning red. When the latter occurs, in the presence of sun light for instance, their red colour is even more visible against white backgrounds. Up until now this microalgae was known to be found in bodies of water in the Northern Hemisphere, especially in North America and along the European Atlantic seaboard. However, their rare presence in peri-Mediterranean environments such as Zamora stands out. "What is interesting is that we have confirmed that this species does not appear in Sanabria Lake or in the reservoirs surrounding the village of Ayoó de Vidriales -says Fernández-Lozano- so they must be coming from some other place". In order to try and find out where this species is originating from, the researchers analysed meteorological data, especially wind patterns, corresponding to the days of 'blood rain'. The results of this analysis reveal a connection to prevailing westerly winds that would have affected the north-western area of the Iberian Peninsula during the autumn of 2014. However, the study was not able to identify the exact source of these microorganisms, suggesting that they may have even come from North America. In recent years, the use of Haematococcus pluvialis has spread to the pharmaceutical industry owing to its antioxidant properties. Its application has also been extended to fish farms where it is used as a food source for salmon and trout in order to give these fish a deeper red colour. Thanks to food sources containing these non-toxic algae flamingos can boast their pinkish hue as well. The motorcycle manufacturer Yamaha recently found a way to reduce CO2 emissions in their factories by using these small algae. The company was able to succeed in this by injecting carbon dioxide into huge pools full of Haematococcus. Other genera of microalgae, albeit of the saltwater variety, are responsible for the red tides that sometimes occur in estuaries and costal areas all over the world from Galicia to California and Australia. 'Blood rain', however, is not as common an occurrence as these red tides. The most famous 'blood rain' phenomenon was that of Kerala, India in the summer of 2001, since then happening once again in the southern part of the country and in Sri Lanka. Scientific studies have confirmed that the algae Trentepohlia was responsible for this event, while ruling out the opinions of some researchers who suggested alien or extraterrestrial sources. More information: Javier Fernández-Lozano, Antonio Guillén-Oterino, Gabriel Gutiérrez-Alonso, José Abel-Flores y Joaquín Pérez-Turrado. "Revealing the presence of Haematococcus pluvialis (Flotow, 1844) in Zamora province (Haematococcaceae)". Bol. R. Soc. Esp. Hist. Nat. Sec. Biol. 109: 103-109, 2015.